If you do a search in Basenotes for fragrances that were released in 2012, you will see that they've listed 998, and that's only scents that have made it into their database — there must surely be omissions — and with two months left in the year. Sturgeon's Law states that 90 per cent of everything is crap, and I think he was being generous: I think 99 per cent of everything is crap, so by Sturgeon's reckoning there have been a hundred good-to-great scents launched so far this year, and by mine, perhaps ten. It is impossible for any industry to sustain that level of product launch and have most of the products be any good. Even if every single perfumer were an artist, every company desirous of achieving greatness with every perfume, the economics of the industry guarantee that they will fail, because there is still the marketplace to contend with, and customers don't want avant-garde, they don't want art, with all that that entails: they want to smell nice (a samey, copycat, mass-market idea of nice, not an artist's or an innovator's idea of nice), and they want to pay a reasonable amount of money for the privilege. So I don't think I can be blamed for giving the side-eye to department-store men's fragrances. Most of them, since Sturgeon's Law holds in perfumery as in every other field of human endeavour, aren't very good, based on the basic template that was established in 1988 with Davidoff Cool Water, which took over the world and was cemented in place over the next decade or so: men must now and henceforth smell freshly showered, clean, airy, watery. It may have seemed new then, but an endless stream of watery-ozonic aromachemicals ensures that there is no end to the theme, and now, a quarter of a century later, it's as played-out as anything can possibly be. Imagine my surprise, then, when I tried Fan di Fendi Pour Homme and discovered that it's attractive and wearable! The gold colour might have tipped me off: usually, fresh-aquatic scents are some shade of blue (or, to be daring, pale green, especially if they have green notes), whereas gold usually denotes a warmer, more oriental scent — not universally true (oriental A*Men is blue, fresh Life Essence is yellow-gold), but often a reliable visual shorthand. 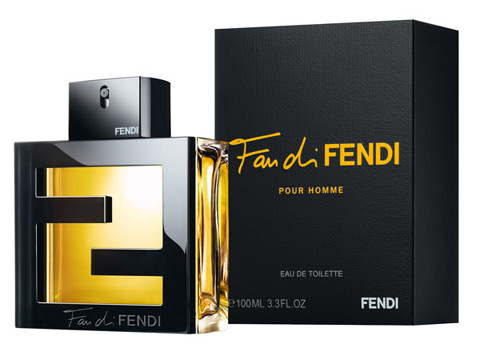 Fan di Fendi Pour Homme does start out fresh, but not noxiously so: a little gust of fresh air (as if no men's scent can be without it any more) riding on the coattails of bright citrus notes. Almost immediately afterwards, the main theme is introduced: woods and spices, as masculine as you can get. There's supposedly a "soft leather accord" in the base, but it's not important: mostly you have those gorgeous spices — now sharp-edged, now smooth— dusted over rough wood (supposedly Texas cedar, probably mostly synthetic, not that it matters), for hours and hours. This is a terrific thing for a man to smell like. There's nothing innovative about it, and if you have a spicy scent or two in your collection (it suggests the discontinued Escada Casual Friday and the still-available Halston Catalyst for Men, among others) you probably don't need this one: but in a market saturated with poor imitations of fresh air and noxious shower-clean soapiness, Fan di Fendi Pour Homme is a welcome change of pace. Have you tried Victor&Rolf's Spicebomb? I tried Fendi's Pour Homme today after reading your review and was a little taken aback by how much it smells like Spicebomb. If anything, Spicebomb to me is a little more foody and a little less "cozy". I still love them both either way. I haven't had a chance to try Spicebomb yet: it never showed up in this part of the world (unsurprisingly), and the last time I was in Toronto (this past summer) it had just been released but I never located a bottle of it. I wanted to, though: it sounded like my kind of thing. It's nice to see some spicy oriental scents fighting back the deluge of aquatic fragrances. (I expected something similar of Marc Jacobs Bang, which was supposed to be all about spices, especially pepper, but I thought it was just boring.) I really was surprised at how much I liked Fan di Fendi Pour Homme, and I'll give Spicebomb a try if I ever run across it. I feel the same about Bang. Should've just called it Naked to match the ad campaign and the nothingness of the scent. It'll be interesting to hear your thoughts on Spicebomb. It had widespread coverage and availability over here in Sydney, Australia when it was released. I'm not too sure of its current popularity but I'd definitely be happy sniffing this on more people.